So, as the title says I’m terrible with picking and choosing plants and where to put them. I was thinking of putting those plants I have on the tight side all along the back but I also want some variety, but not sure where to go with it. I also think I want to get rid of the grass. I tried to create a carpet but then got a cianobacteria outbreak that killed it. It’s a 14 gallon tank with 11 gallons of water. I’ve tried swords but they got too y’all. Is that stone in the middle coral? That amount of coral could really play with your water parameters thereby creating algae outbreaks. What are your parameters now? Asymmetrical tends to work better than symmetrical layouts. You could try pushing the rock more to the right and moving the left plant to the right as well. So your height is on the right and your ground cover is on the left and front. Maybe add a mid-height plant coming out from behind the left side of the rock. Great advice!! Thank you! 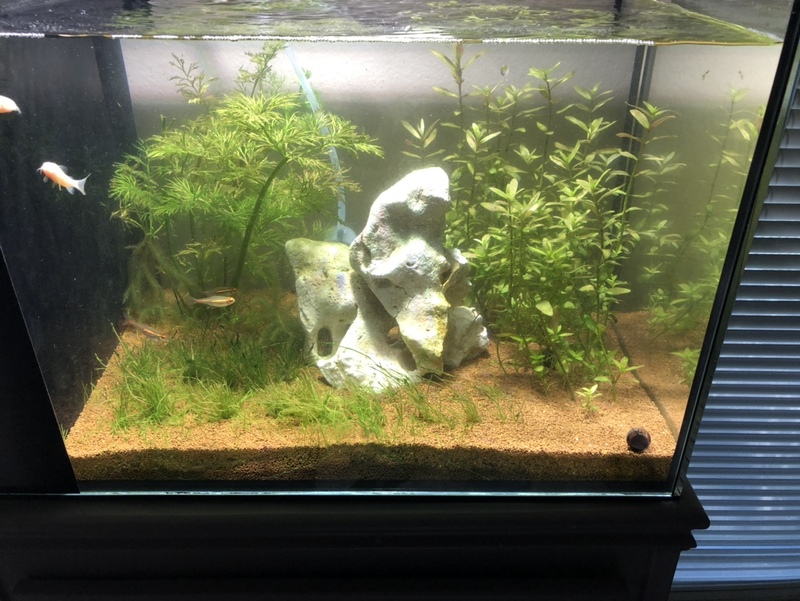 Could you recommend any plants to pair with the ones on the right side of the tank? I’m not sure I know of any mid tier height plants good for 14 gal aquariums. Also, what’s good for ground cover? I’m over the hair grass, it’s more like devils hair grass not dwarf hair grass haha. I’ll have to let others answer those questions. I’m a planted newbie myself. Long time Saltwater Reefer. But that doesn't really mean it is a disaster as what limestone does for your water will depend on what the water has at the start. If you have the "normal" hard alkaline water from the areas where limestone is the normal rock, the water will change very little as it runs in limestone much of the time. If you live in areas where the water is soft and acidic, the PH/GH/Kh may all change, so it may be worth knowing as it can change what plants grow best. I think of rocks and water somewhat like dropping black ink into black paint in some cases. I f you do, it may not make much difference but if you drop the same ink into white paint, it makes a lot more difference so knowing what water you have can be important as it does change what you can get away with due to the buffering of hard alkaline water. But that was not the question!! So I might suggest looking for some of the shorter variety sword as they do come in a range of sizes and types even though the big ones may be what we find in a shop more often. Anubia does well as well as crypts of various type. I have extremely hard water and find Java fern and java moss are both good. 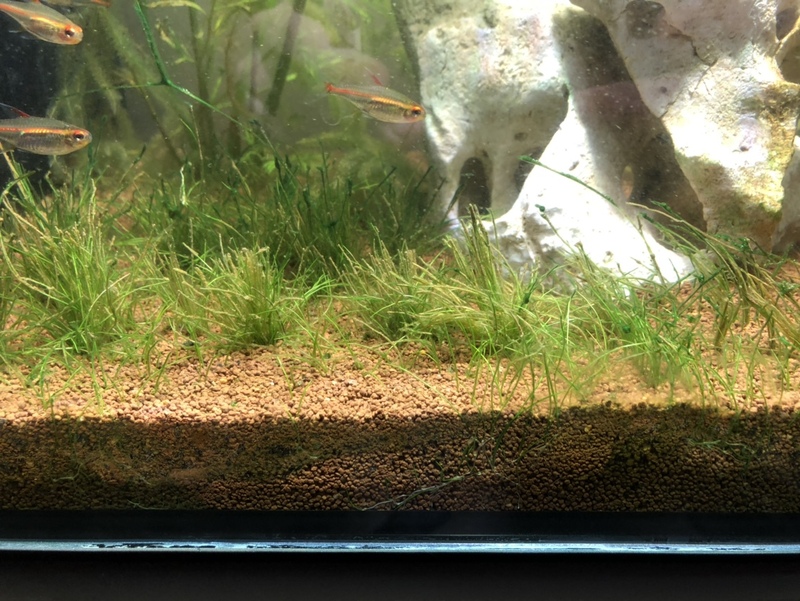 I keep rough tough fish who tend to dig, so the small grasses are not good for me but there is a small grass which grows in a chain to spread across the tank and it is good for me. Can't think of the name right now but perhaps others could suggest the right name. Is there a pygmy sword grass? The front row of short plants in this 20 long grew in from a couple starts. Anybody got a name for it? I have used micro sword before....but I think dwarf sagitaria works well in low light. I’m using RO water to fill and declorinated tap(half and half) for water changes. And you were spot on, it’s definitely limestone! Sounds like you have a plan in motion for any problems with the limestone! I don't find it a problem and just never try to fight it, but that is a deal where we each need to decide how we want to go. I'm just a bit on the "low-work" train and just go with the plants which seem to agree with that plan! One point that might be mentioned is that 8 hours straight might be on the high end of time so if there is an algae problem, I might look at cutting the total time even if it means having some dark period to get the tank lights on while I'm there to see it. Lots of small things to play with to find what might work better and light seems to be one of the things that is hard to get set. About the time I get a tank going right, the plants want to grow and throw the whole question into doubt again!! Between me, my plants, and fish, somebody's often a bit grumpy! I'll recommend a few plants for you. These are just some good mid to foreground plants. Some need more care then others listed but all are pretty easy to grow. Replace plant back right with some cory. stricta for a more bold, broad leaf green pop. Try some Littorella as foreground, slow spreading so plant in denser clusters. Just order one culture of plant it see how it goes, then after determining its right choice order couple more cultures to fill in. Then maybe try some crypt Lucen or Parva as a slightly different height/texture on other side of tank. Now we get to white elephant in the room. That big white rock. It distracts from everything else in tank and pulls your eyes away from plants. I would tilt it over towards front right, move it back 1” or so. Then I would completely cover its top in fissidens. Then get small driftwood coming up from behind/end of rock angled up into left end of tank to give your hardscape some balance. That big white, well illuminated monolith in center of your tank looks fake and it looks forced. In slightly bigger tank with some white’ish substrate it would look great. I love the unusual shape of it a lot but simple truth it’s just a bit to big for this tank. I’m sure that’s probably why you stood it up on end, to minimize the planting area it would cover. I’ll look into those plants, thanks! And you’re completely right in the reason I stood it up. But I like your idea of putting it on its side with some driftwood. I originally had a piece of driftwood in there with it, but it just never managed to sink even after soaking it for three weeks. So I got rid of it. And ideas on how to get them not to float? How would I go about attaching the moss to the rock? I see some use super glue, would that work with the rock already being saturated? The reason I thought of just tilting that rock over towards front right is it will make nice little overhang and have that cool hole in it and led light will look cool shing through the hole. Wood. Remember that wood has a capillary network, it’s how it pumped water and nutrients to its leaves. In a dry piece of wood those networks are now filled with air. If you completely submerge a dry piece of wood the outer layer become permeated with water which has a higher viscosity than air and completely seals the air in the wood, only way air can get out is osmosis through both the water and wood fiber. It can take months if you do that. To water log a piece of wood start with small end 1/3-1/2 in water and always leave cut end (capillary pipes) completely dry so air trapped in there has a easier pathway out of wood, then raise water every couple days till it’s submeged or close to. Then if needed drill a hole and zip tie a ballast stone or for odd shapes just epoxy a stone on. For seeding rock with moss my fav simple way with flattish areas like back area of that rock probably is (?) is Sandwich bag plastic . Take piece cut slightly bigger than area you want to start, make it big enough so drapes over edges about 1” then roll over edges then take lead plant weights pieces and poke them through plastic around edges. You’ve made a weighted clear plastic tarp, cut you some 1/4” slits or X abouts every 1.5” so it can breath. Draped over back of rock folded in half and take angle planting tweezers and just start tucking moss under wrap, as you fill it up pull wrap forward to expand area. When all filled with starters if rock has odd shaped dimples/curves just set a small pebble/plant weight to push wrap down so moss makes good contact with stone, is perfect for doing this ,it’s flexible, it’s clear so light get through, you’ve cut some slits so it breaths, moss won’t root to plastic wrap but it will root right on to that calcium based stone. Wait 3+ weeks, pull tarp off, done. 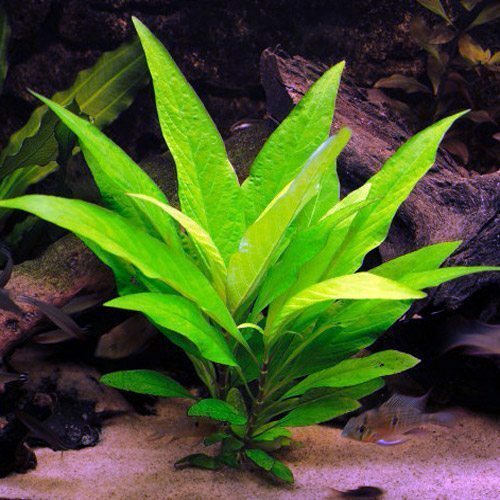 If you do get some driftwood coming up from back end of rock like I suggested, that little intersection where calcium laden rock meets wood, meets iron laden gravel would be nirvana for nice crown type plant like sword or dwarf lily. Java fern and Anubias would do great mounted right there in crevice. 2-3 crowns of crypt undulata red would make a nice centerpiece plant there, makes a nice 7” reddish vase shaped clump.